As I write this article Sister Marge and I are preparing for our third National Session. This one we are proud to be going to as it is in our home state. I hope to see many Connecticut members during the week and I hope those that do attend enjoy it and learn more about it. Our State Session ended a short time ago and if you read the November Granger you already have some idea of what transpired. Your delegates conscientiously acted upon thirty-four resolutions, three of which will be acted on at the National Session. I’m sure they will be reporting back to their Community Granges as to the disposition of each Granges Resolutions. As each of you work through the year observe the needs in your community or what needs to be changed or done better and start writing resolutions for next year. 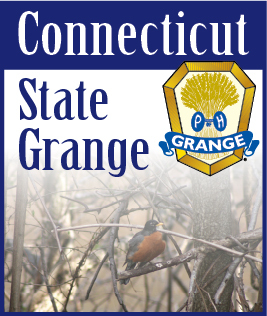 Remember, resolutions you submit to the State Grange earn you points on your Honor Grange report. This year was also an election year and you know the results of the election by now. I am honored that the delegates had enough confidence in me to elect me for another two years and with your continued support We will do our best to grow and move our Grange forward into the future. Another important event last month was the Pink Sash meeting on November 22 at Cheshire Grange Hall. Although as I write this it has not taken place yet but my January article will have many details about it. All of the programs and contests that were planned will be in the new Blue Book. Each Community Grange should spend at least one meeting reviewing the Blue Book and the Honor Grange Report to adequately plan their activities for the year. Join the contests, they are fun and you may win a prize. This is a very joyous time of year for us all. Admits all our work and fun we take time out to celebrate two special holidays. I hope you shared Thanksgiving with your family and friends and as we look towards the end of the month Sister Marge and I wish all our Grange friends a Merry Christmas and a Happy new Year.